More than 2 million people around the world to participate in signing a peace agreement. On the summit World Alliance of peace, religion, or WARP, held in Seoul, South Korea. On 17-19 September 2014, has had the summit. World Alliance of peace, religion, or WARP held in Seoul, Republic of Korea, is host to the world peace. And restoration of light or HWPL which is attended by more than 50 political leaders. Past and Present Ministers from 30 countries, more than 680 religious leaders from 120 countries, more than 600 members of the Youth International Peace (IPYG) from 150 countries and more than 200 journalists from over 100 media organizations in 80 countries and is the first day of the summit WARP ceremony. open and show at the Olympic Stadium in Seoul and the 2nd day of the conference, has signed an agreement unity of religions held at 63 Meeting in Seoul. Summit World Alliance of peace, religion, or WARP is considered the biggest event of the politicians of religion, and representatives from various organizations around the world to participate. The Summit This is the result of Mr. Lee. World Peace Tour Serves as the foundation for the entire war to mingle. And contribute to world peace. The agreement states that religious leaders must unite their religion is one of the building in order to bring the war to an end. And let the peace of the world for generations to come. And representatives of the United Nations should make every effort to enact law. For the cessation of all hostilities and contribute to world peace. It also states that the signer will become an advocate for peace at this news to people all over the world and encourage them to cooperate in the work of achieving world peace. An agreement that has been read aloud, it was emphasized again that peace can not be achieved by any one. But the success of the unity of all working together as one. 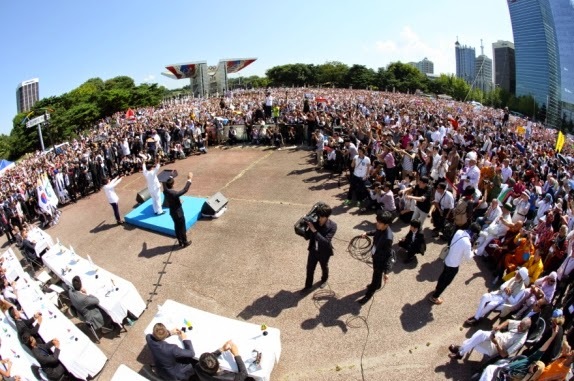 The Peace advocate Lee Man Hee (Man Hee Lee) who hosted the president of HWPL expressed deep regret over the present state of religion. And stressed Religion is a good thing and that religion is bad, we have to see that religion itself is damaged. Fair, not the teachings of men. Which Mr. Lee has called on politicians to support in respect of policies and laws. Then Chairwoman of IWPG, president of the International Women's Peace Group (IWPG) said the agreement is only the beginning. It has enormous power to include contracts with one another and open either. World into a world of peace. This one piece of paper that connect one country to another, and together the different classes and different religions. There was a path to world peace. World Peace was held at the gate of Seoul's Olympic Park. An estimated 200,000 people attended from all over the world. Attending this conference.